Graphical Installer uses modified version of Inno Setup Compiler and Preprocessor for compiling script files. Inter alia directive WizardSmallImageBackColor was modified. This GraphicalInstallerUI is used in directive WizardSmallImageBackColor and defines UI file for compiler. UI file defines design of resulting installer: it contain dimensions of forms, labels, position of controls and many more properties. So directive WizardSmallImageBackColor tells the compiler how the final installer will look like. 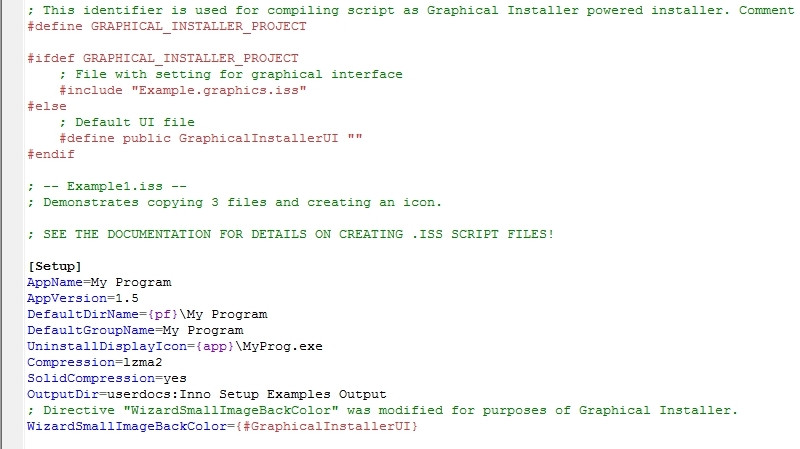 If this value is equal to "GraphicalInstallerUI" then GraphicalInstallerUI.e32 is used. For all other values (even by deleting whole directive) original Setup.e32 is used. Do not worry about this warning: It simply informs you about modification of this directive, because this directive became obsolete in Inno Setup version 5.0.4. It has no effect in scripts that not use Graphical Installer.